Enough already with the unrelenting weekly blast of winter. I've been on a bit of a citrus fruit kick for a couple of weeks -- craving salads with bright, cheerful colors and fresh, tart flavors. Kind of like a really cheap escape to more temperate climes for those of us who don't follow the sun to its winter retreat. But for dinner, I had to move on to the next item on my all-time favorites list -- pizza! Now, I will admit to the slightest bit of temptation to create a citrus pizza, but . . . naaah. Besides, I found some pre-made crusts in the freezer and I had fresh basil in the fridge and a box of grape tomatoes on the counter, so I was three-fourths of the way to the classic Pizza Margherita. Aaaaaaa, no mozzarella in the house! Furtive glance left and right - no pizza police in sight. The crust was the thinnest possible blend of flour, water, yeast and salt. Snap! The little tomatoes were warm, without being mushy. Pop! The melted provolone proved to be an amazing substitution. Slurp! And the basil was . . . well . . . the basil was . . . the perfect part of the pizza . . . to the point of being . . . transcendent! Forgive straying from onomatopoeia, but such is the effect of basil . . . in frigid February. All of the sudden it was warm and sunny again . . . like I was in Naples -- Italy or Florida . . . take your pick! Both are warmer and sunnier than the snow-crunchy, ice-slippery, wind-biting midwestern prairie we call home. Note to self . . . they call pizza comfort food for a very good reason! Healthy comfort food, in this case. You cannot make me think less! Pizza . . . good pizza . . . can transport you to a better place, just when you need it most. If you can't be there . . . and they won't deliver . . . just do it yourself . . . see below. You'll thank me for it! Spread some olive oil on the pizza crust. Place Provolone slices over oiled crust. Slice tomatoes in half and place cut-side down over cheese. Roll basil leaves together and slice crosswise into ribbons (chiffonade) and sprinkle over entire pizza. Finish with Parmesan over the top. 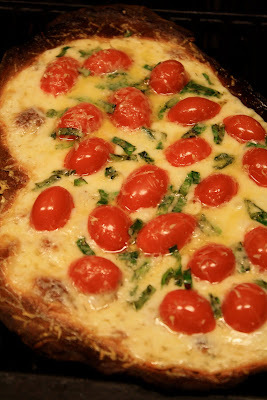 Bake on a pizza stone in pre-heated 450-degree oven until crust is brown and top is bubbly. Enjoy your trip to Naples! How far we've all come since the 4 of us met for Friday night dinner at the Pizza Inn in Bossier City! No better way to escape the cold than to hibernate with a good movie and a hot pizza! Hi Cora! I'm finally getting back to blogging and catching up with friends' blogs. I still just love yours. but now I am craving Pizza Margherita. Yours looks so delicious. I've been using the CA Pizza Kitchen dough recipe for several years, but will try yours on the next pizza. Becky, so good to see you back where you belong -- blogging and commenting. I saw on your blog that you were making pizza. Let me know how my crust works for you, if you try it. We love thin and crispy and this one never fails to please us or our guests.